We asked our in house photographer & super talented food blogger & stylist Lyndsey Eden to join us increasing the perfect holiday tablescape. 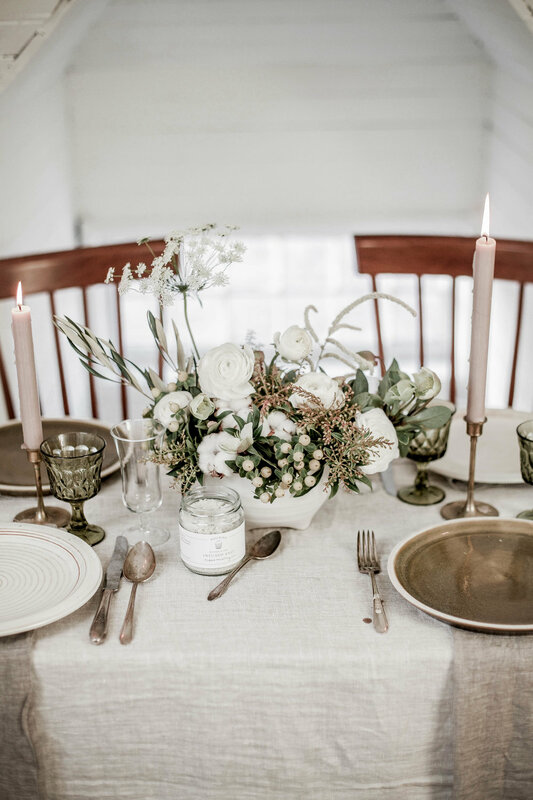 Read on for her best table setting tips that will make your holiday table unforgettable! If there is one thing I love during the holidays it's setting a breathtaking table for all my friends and family to come gather around. Truth be told, I would keep my table set all year long if my sweet but pesky little kitties wouldn't turn it into a world war II scene the moment I am not looking. We gotta love our fur babies, am I right?! First rule of thumb for any holiday table is picking your colour scheme. Think outside of the box too; just because it is Christmas doesn't mean you have to go with the classic red and green to create a holiday vibe. Use one of those colours (or neither! ), gold and silver, or even a blush pink can be beautiful around this time of the year. Seeing as we are heading into winter I choose to go with creams and iridescent greens. I always think tables look most beautiful with a neutral base, and then you can add in touches of colour here and there. Once you have your colours picked -for the most cohesive look- stick to them! From the table cloth to the plates to the stem ware to the flowers and yes, even chairs.! Rook & Rose created this gorgeous and elegant bouquet from a mood board sent to them. Say what?! Yup, the best way to get the exact bouquet you are looking for that goes with your colour scheme is to send your local florist a mood board! Most floral shops are so happy to create something beautiful for you, and the more information you can give them the more helpful it is. You can create a mood board on Canva with pictures gathered from pinterest or instagram, and then let the florist have free reigns with the magic touches. Or try making your own arrangement! The step-by-step instructions to make the exact arrangement in this post can be found here. To create depth when styling a table, layer! Of course you don't want to go overboard, but the more layers you create the more spots your guests have to admire when sitting down. Plus you will get that "ahhh" exclamation when they enter the dining room! 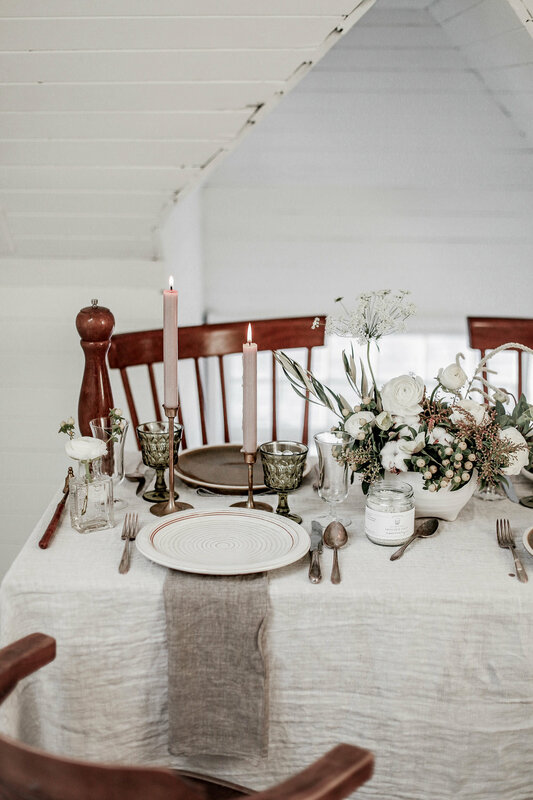 Here I started with a neutral linen table cloth and from there added in soft grey napkins (these can be placed like so under the plates or you can bundle then beautifully with a napkin ring and place them on top of the plate). Each napkin version allows a different layering effect to go along with the place setting. To finish off the layering I added in some special elements; silverware (my grandma's old set) set to etiquette book standards, a bottle of wine (if the bottle is pretty I usually set it out as is, but you can always pour the wine into an old fashioned decanter to add that extra nod of elegance), a copper water pitcher, lit candles, a smaller vase with a single stemmed flower on one end of the table to balance out the larger centre piece, and some herb infused salt (purchase here) to bring it all together. To create that put together yet whimsical look, I love to mix and match certain elements. Here I used a couple of different ceramic plates (made by the talented Patti Chiapinni ) that off set each other perfectly. They both had an element from the colour scheme (green and cream) and being ceramic added to the soft, timeless feeling bring created. Now, if you had a soup or salad to start, adding in a bowl or smaller starter plate on top of the main plate (either wooden or ceramic) would add in another compelling layer. The next whimsical feel came from the mix-matched chairs. I love a table set with different styles of chairs, but in the same colour or material. Here we used wooden chairs, but as you can see they are all very similar in colour so they worked really well together. Whatever the chair may be, as long as they are the same painted colour or solid wood, mixing and matching the style of the chair around the table gives that put together vibe without looking too put together. 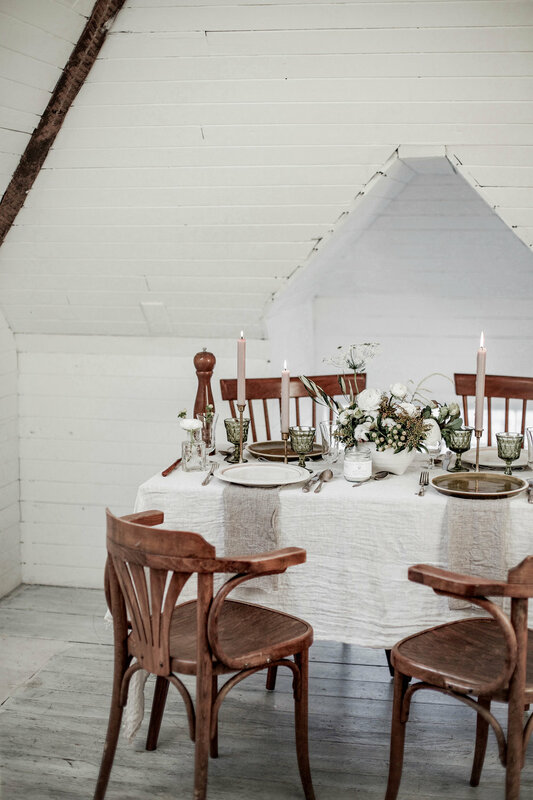 Table settings do not have to be expensive. I find the majority of my table items at thrift stores or local vintage shops like Westward Goods (where those pretty little iridescent green wine glasses came from). The best place to find silverware (unless you have been passed down a set) really is thrift stores, and Victoria is filled with an ample supply of vintage shops where you can find mix and match pieces to create an entire collection for a fraction of the price. Those "fancy" water glasses? Again, thrift stores are the perfect spot to check out. Look in the glass section by the champagne glasses, and you will find all sorts of vintage style glasses for probably less than $1 each! Candle holders, old wine decanters, vases, even linens - rummage those thrift and vintage shops, I tell ya. You will find some classic goodies. Alright, now that you have all my tips and tricks for creating a whimsical, jaw dropping, beautifully layered holiday table share them with us! 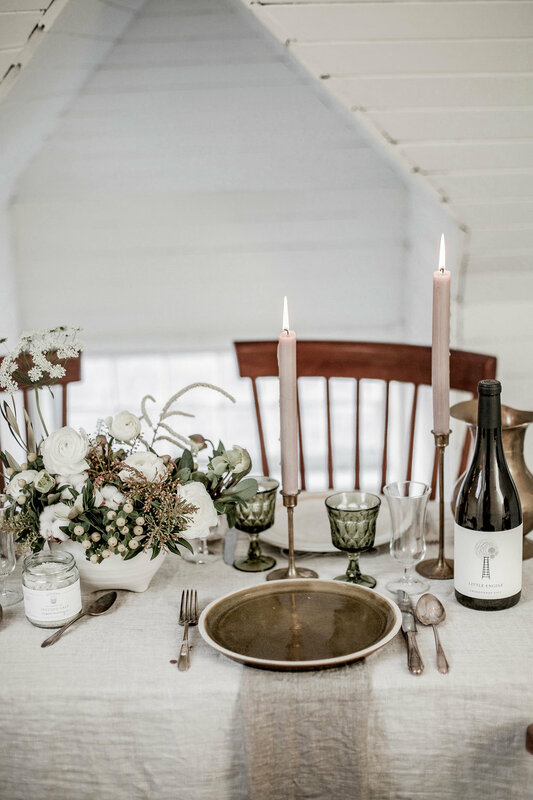 Tag @lyndsey_eden & @nourishvictoria in your Instagram table settings so we can see the beauty you create. Happy Holidays sweet friends!